First published: 2 September 2015; updated 16 March 2017. My goal for this post is very modest: I want to turn words into pictures. I see lots of confusion and questions about the kbeauty skincare routine order. And for good reason: it’s confusing! 2017 update: The guide is now interactive*. You can click on the images of the bottles below to see all the reviews I’ve written on that product type (the image that shows every step in one photo isn’t clickable like that btw — if you click on it, it opens into a new tab for easy printing). *hopefully. Tell me in the comments what sort of device, operating system, and browser you’re using if it’s not working for you. Desktop works better than mobile, but it should work on mobile. Hopefully. This is also available as a PDF for easy printing. This post provides a recommended order for layering skincare products–you don’t need to use all of these products in the same routine!! And you probably don’t even need to use all of these products ever. Do what’s right for your skin and your skin goals. I’m messy and busy and distracted, so I like to put eye cream and spot treatments over creams and sleeping packs. I think that it helps them stay in place better. Other bloggers and kbeauty fans recommend doing things differently, so feel free to experiment and see what works best for your skin. This post is a visual adaptation of info that already exists; I’m not inventing anything new here. Start with Asian Skincare 101: A Beginner’s Guide & FAQ on the Asian Beauty subreddit by Jude of Fifty Shades of Snail. Jude also wrote a post on How to Build an Asian Skincare Routine (without breaking your face or your wallet) for Fifty Shades. 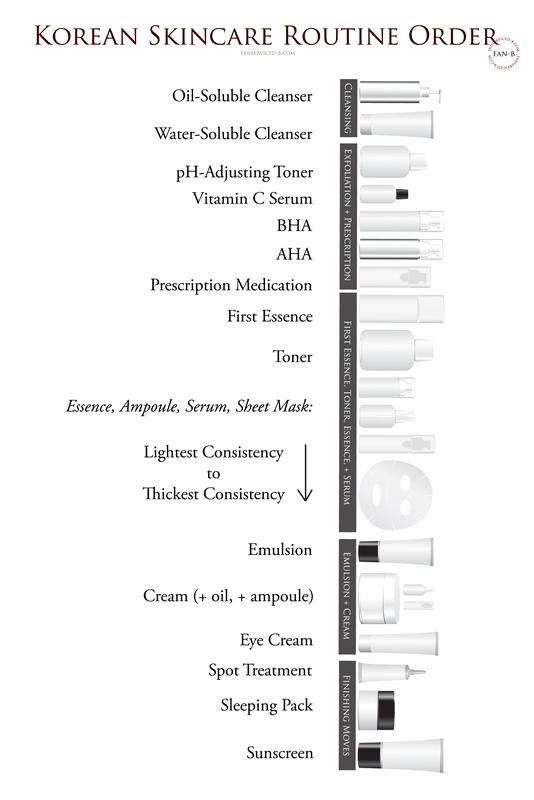 For a longer post on how to organize your routine, including how to order the pH-dependent parts of your routine see Skincare Discovery: Putting your products in order, including pH dependent acids by Cat at Snow White and the Asian Pear. For a comprehensive post on differences between Korean and Western skincare philosophies, routine order, shopping recommendations, and recommended kbeauty blogs check out Kerry of Skin & Tonics’ Asian Skincare Guide: The Korean Skincare Routine. My routine for hormonal acne and oily skin can be found here on fan-b. Cat has skin very similar to mine, but we use some different products and live (or lived–she has since moved out of the desert!) in very different environments, which results in her current [summer] routine having some fun twists like more sheet masks–find it at Snow White and the Asian Pear. Sheryll wrote about her morning routine and evening routine for banishing post-blemish hyperpigmentation in super polluted Ho Chi Minh City at The Wanderlust Project. Kerry has hormonal acne and dry skin (or did until her routine ended it!). Find her morning routine, evening routine, and special care routine at Skin & Tonics. Jude’s skincare goals are combating signs of aging and hydrating her naturally dry skin. Find her current [midsummer] routine at Fifty Shades of Snail. So, heh, true story: my hair is falling out. Well, not all of it, but two patches have fallen out and the doctor said it’s stress-related but not serious. Apparently this is just a thing that happens to stressed bunnies, so I will work on, like, doing things less stressed people do (I dunno? watch tv? get…massages?). I’m already not the best (to put it mildly) at responding to email and comments, but there are resources for getting routine feedback even while I’m off trying to get my hair to grow again lol. You could attempt to do routine construction teamwork in the comments here, but the best place for routine help is the Asian Beauty subreddit’s daily routine help and troubleshooting thread. Thank you so much!!! I’m SO glad that it’s useful!! Hi Tracy, I hear ya on the stress. Have you looked into supplements to help your hair growth? I use this for my nails, but hair is made of the same stuff – Andrew Lessman’s Healthy Hair, Skin & Nails. You can purchase it at HSN. Thank you so much! This is the best. Thank you for taking the time to put this all together. I’m a novice to K Beauty so this is very helpful! This is so useful! I’ve been reading so much about Korean skincare and love seeing other people’s routines but agree that sometimes even understanding the fundamental components can be so confusing! Hello ! First of thank you for this very useful and comprehensive guide. I just don’t understand one thing, what is the difference between BHA/AHA toners and ph balancing toners ? So far I have been doing this > Oil cleanser > Hadalabo hyaluronic acid low cleanser > CosrX bha(whitepower+A-sol)> C20 serum. Can I just oil cleanse >foam cleanse > vitamin C and then use my BHAs ?